We are currently offering 1 months free AdWords Management, when you sign up for 6 months. Sign up now using the form provided. Download our eBook ’10 reasons why it makes more business sense to outsource your Google Adwords’, using the form below! To avail of our Google AdWords Special Offer, simply fill in your details in the form below and we will be in touch as soon as possible. Switching Your AdWords Management Agency Is Easy! 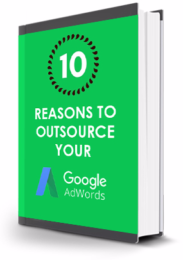 10 Reasons Why It Makes More Business Sense To Outsource Your Adwords Campaigns. Download Ebook now. WebResults is an Irish based and Irish owned Digital Marketing business up and running in Ireland for over 10 years. Rosey Broderick & her team have extensive experience in setting up and managing Google AdWords campaigns for clients both in the business to business and business to consumer space. WebResults have worked with over 500 clients in setting up and managing AdWords client accounts and many more than that on Digital Marketing Strategy and other Digital Marketing activities. As an AdWords client, you can access our in-house system to see all tasks we carry out relating to your account and time allocated to these, as well as access regular reports, actions and insights to show how we are maximising your performance. Talk to us now on (01) 207 1872 or simply fill in a Contact Form for a prompt response to your query.